Michelangelo, the father and master of all the arts, died in Rome on February 18th, 1564, at the age of 89. He lived in Rome for thirty straight years, without ever coming back to Florence, his city. For Cosimo de Medici, Grand Duke of Tuscany, this was a big sorrow. He tried in any way to convince the most famous artist ever to come back, including naming him first director of the Art of Drawings Academy, founded in 1563, but in the end, the reason why Michelangelo decided not to come back is exactly because Cosimo and his family had turned the Republic of Florence into a monarchy. When Michelangelo died, Pope Pius IV ordered that his body was buried in the St. Peter’s Basilica (a great honor for an artist), but despite this, Michelangelo tomb is in the Basilica di Santa Croce, In Florence Italy. Michelangelo had his family in Florence, in particular his nephew Leonardo, who also was his heir. Leonardo Buonarroti went to Rome where he received his heritage, but also, probably helped by Cosimo de Medici, organized the transfer of the corpse to Florence. He knew that most probably the Pope would oppose to the transfer, and decided to hide the body into clothes, placing it into a grocery cart pulled by oxen, with destination Florence. Three weeks later the body of Michelangelo arrived in Florence, where it was placed in the Compagnia dell’Assunta. Two days later it was moved in Santa Croce by the members of the Art of Drawings Academy. Giorgio Vasari, one of the biographers as well as one of the greatest fans of the artist, had the honor to design Michelangelo tomb. The monumental tomb is surrounded by frescoes by Giovan Battista Naldini, with angels holding a curtain and a representation of Pietà. On top of the tomb is a bust of Michelangelo, a work by Giovan Battista Lorenzi. Three statues are sitting in front of the grave, sad for the death of the greatest artist ever. They are the personification of Painting (left, by Giovan Battista Lorenzi), Sculpture (center, by Valerio Cioli) and Architecture (right, by Giovanni Dell’Opera). This tomb inaugurated the tradition to consider the Basilica di Santa Croce as a temple of the Italian glories. 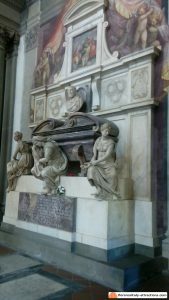 After Michelangelo, many more famous Tuscan and Italian people have been buried in monumental tombs in the Basilica, most notably Galileo Galilei, Niccolò Machiavelli and Gioacchino Rossini. Cosimo de Medici couldn’t say Michelangelo was at his service, but could at least say that he was buried in Florence. Leonardo Buonarroti, the nephew of the artist, in order to gain the favor of the Grand Duke, donated to Cosimo five unfinished works: the four prisoners, visible at the Accademia Gallery, and the Genius of Victory, today at Palazzo Vecchio.